A quickie birthday gift, originally uploaded by indiaeden. I ran this up yesterday for a little girl I know who will be 4 on Saturday. I based it very vaguely on the sundress in Betz White's book Sewing Green....that means I looked at the pictures and skim read the instructions! It's basically a version of the pillowcase dresses you can find instructions for all over the internet....except I used yardage as I have no luck at all finding pretty pillowcases in the charity shops around here, I do keep looking though. I have another one cut out and ready to sew up later today, for another birthday girl. Only problem I have is, and this shocked me to the core...I'm all out of ric rac!!!! How can that happen? I need to go emergency ric rac buying asap! That is very pretty! I wish I had more girls to sew for! Fiona, you could so easily run these up for your girls, they would look adorable in them! Very cute! Love the fabric! It's one of my favorites! The thought of emergency ric-rac buying made me laugh, but it's not the thing to run out of is it!! 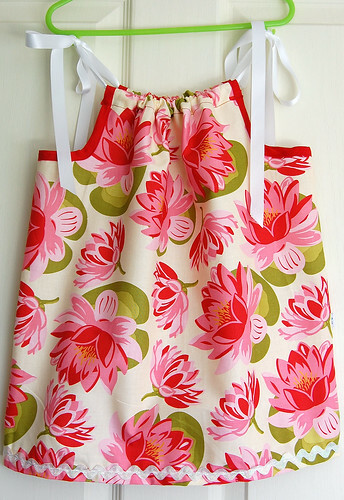 i have made loads of those pillowcase dresses- they are so easy and look so pretty on.